A ruptured gas line on Oak Grove Road in Newburgh caused a frenzy for some homeowners Friday morning. “I heard a loud hissing sound and looked in the back yard and it just looked like a water main had broken,” says homeowner Rick Jenkins. However, it was not water spewing from the ground, but rather gas coming from one of the main gas lines. Homeowners were considered to be in immediate danger of this alarming discovery so firefighters evacuated a dozen homes. “We went door to door in a certain perimeter that was the ‘hot zone’ if you will,” says Captain David Shipley. It was a joint effort among the local fire departments to get this leak under control while keeping the community safe. Local fire departments are also monitoring sewers and checking the meters of every home near the gas leak. 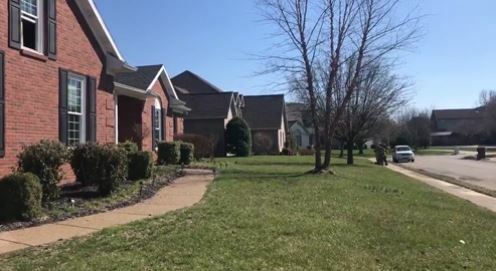 “We don’t want a homeowner to come back to their home and have an ignition source obviously,” says Captain Shipley from the Ohio Township Fire Department. Newburgh homeowners say they are relieved no fires erupted from the ruptured gas line.